For human beings, Antarctica is a vast, icy and perennially inhospitable land, approached and inhabited by only the hardiest of souls. But for the Emperor penguin (Aptenodytes forsteri), the continent is truly home – even in winter, when it’s the only animal to spend the season breeding on the open ice. Every winter, once the sea ice has formed, they gather at their breeding ground, the mates of the previous year seeking each other out and spending several weeks renewing their acquaintance. Once the eggs are laid (one for each pair), the male becomes the official incubator, balancing the egg on top of his feet and covering it with a warm fold of skin and feathers. He huddles with other penguins to preserve warmth in this chilly environment, where temperatures can fall below -60 degrees Celsius. Two months later, the male half his former weight, the egg hatches and a new penguin life begins – joining the battle for survival in one of the most desolate parts of the world. 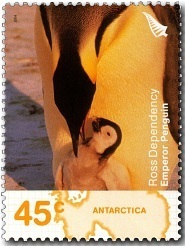 45c - Emporer Penguin and Chick. 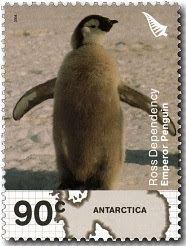 90c - Emporer Penguin Chick. 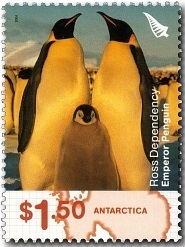 $1.35 - Emporer Penguin and Chick. 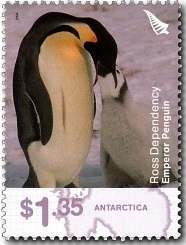 $1.50 - Emporer Penguin Pair with Chick. 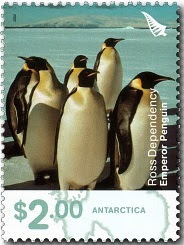 $2.00 - Group of Emporer Penguins. 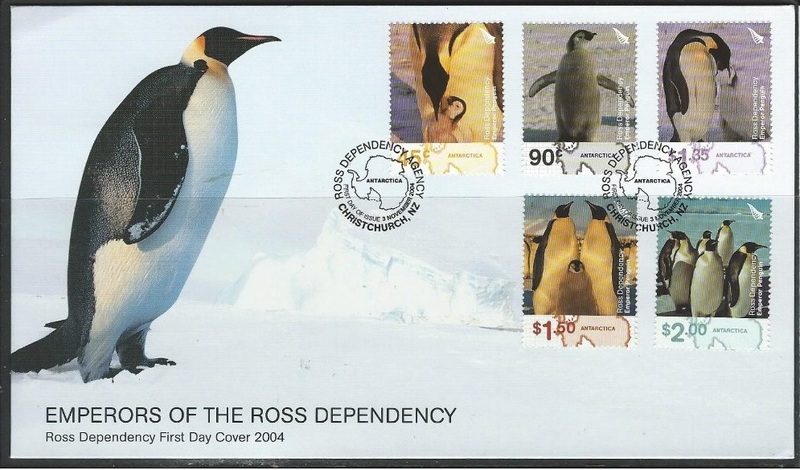 2004 Ross Dependency - First Day Cover.